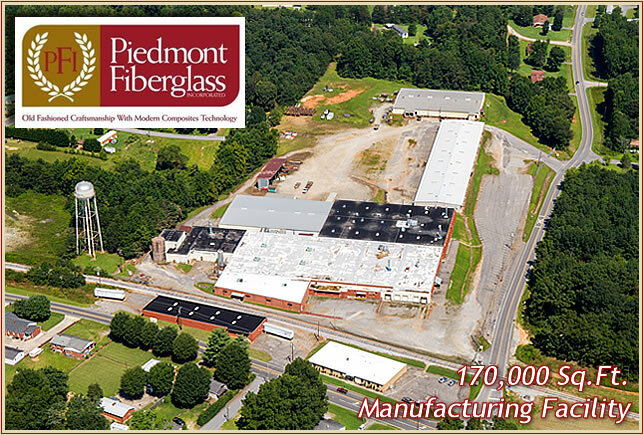 Piedmont Fiberglass is a multi-faceted composites company. We are unique in that we are not limited to one product line or process. Our business was founded in the architectural composites industry and this area remains a strong product line. Since the mid 1990’s we have branched out into other areas of the composites industry. Through training and experience, we have increased our product lines to include: composites tooling, commercial products, and O.E.M. component parts. Architectural Division manufactures Church Steeples, Baptistries, Wall Crosses, and Cupolas. Standard and custom models allow us to meet most design needs. We also manufacture non-combustible wall and ceiling panels for the laboratory, food service, health care, and animal science industry. Tooling Division manufactures composites tooling for composites products as well as thermo form vacuum tooling for the sign industry. Our tooling utilizes the latest in low / no shrink resins to build fiberglass tooling that outlasts traditional systems. Commercial Division designs and manufactures a wide variety of products including: Fiberglass Bait Tanks, Fish Cleaning Stations, Tractor Sun Shades and other products sold to the end user. O.E.M. (Original Equipment Manufacturer) Division manufactures component parts for the Marine, Utility, Communication, Water Recreation, and Transportation industry. Our products are used in million dollar yachts, aerial equipment, satellite communication, and aquatic features around the world.